Pakistan continued their winning spree under the leadership of Misbah-Ul-Haq by crushing Bangladesh in the second Test by seven wickets and dominated the two Test series 2-0. They started the tour with a Twenty20, followed by three consecutive wins in the One Day Internationals and achieved a complete whitewash of the series by clinching the second Test. The Bengal Tigers were bowled out for 338 runs in their first innings and complied 234 in the second. Pakistan responded with a massive total of 470 runs and measured up with the target of 103 by scoring 107 for the loss of three wickets. The final Test of the series was played at Shere Bangla National Stadium, Mirpur, which was concluded on the fifth day on December 21, 2011. 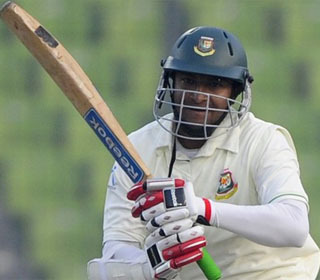 Shakib Al Hasan was declared ‘Player of the match, due to his all round performance in the match as he became the only player for Bangladesh to score a century and claiming five wickets. Earlier Pakistan Captain Misbah won the toss on the first day and opted to field first keeping in view their bowling strength. The home side displayed fine batting performance by posting their best innings total of 338 runs in the series. Shakib was their hero as he plundered 144 runs, Shahriar Nafees was unlucky to miss the century by just three runs. Umar Gul and Aizaz Cheema were the highest wicket takers by claiming three wickets each and Saeed Ajmal had two victims. Pakistan smashed 470 runs in their first innings and earned a match winning lead of 132 runs. Taufeeq Umar lead the batting with responsible 130 runs, Misbah scored 70, Azhar Ali 57 and Adnan Akmal dispatched his first Fifty in Tests by posting 53 runs. Shakib was the star performer with six wickets, Nazmul Hossain held two as Robiul Islam and Elias Sunny shared one wicket each. 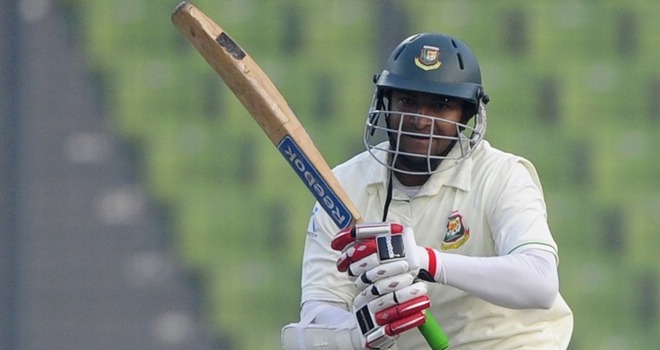 The home side had lost five top order batsmen for 95 runs in their second innings when Nasir Hossain and Captain Mushfiqur Rahim came to their rescue. They shared an invaluable partnership of 117 runs for the sixth wicket and nearly took them to the safety. Abdur Rehman struck for the visitors and removed Nasir at 79 runs and Mushfiq became his next victim after the addition of nine runs in the total when he had scored 53 runs. Saeed Ajmal ripped through their tail by claiming last two wickets and became the first bowler to grab 50 wickets in 2011. The whole side was sent back to the pavilion at 234 runs in 82.1 overs and set a target of 103 runs for Pakistan. Rehman led the bowling attack and took four wickets, Gul, Aizaz and Saeed chipped in with two wickets each. Pakistan sealed the fate of the match in their favour by dispatching 107 runs as they had lost three wickets in misty conditions, Mohammad Hafeez and Azhar played breezy innings of 47 and 34 runs respectively. Nazmul Hossain, Shakib and Elias Sunny added one wicket each in their tally as Pakistan won the match convincingly by seven wickets. Shakib got the honours by clinching ’Player of the match’ while Younis Khan was adjudged ‘Player of the series’ as he amassed 265 runs in the series and became the top scorer from either sides. Pakistan dominated in all three formats of the game and won the two Test series 2-0 in an authoritative manner.